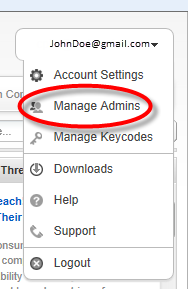 After the admin confirms registration, you can return to the Manage Admins panel and edit information for that user. The status changes to Activated when the user receives the email and confirms the registration. If the user has not confirmed registration, you will see the user's status as Awaiting Confirmation. If needed, you can resend the confirmation email by clicking the envelope icon next to the Awaiting Confirmation status. A list of admins displays. The Account Settings window displays with the Admin Details tab active. 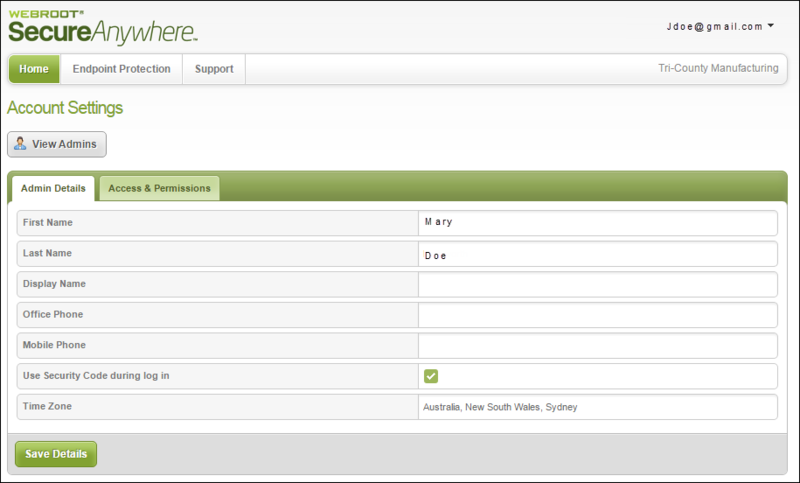 In the Admin Details panel, make any needed changes to name, phone numbers, and time zone. When you're done, click the Save Details button. Click the Access & Permissions tab. The Access & Permissions panel displays. Change any of the settings as needed, using the information in the following table. Select the checkbox to allow the admin to define and modify groups of endpoints. Select the checkbox to allow the admin to deactivate and reactivate endpoints from the Management Portal. For more information, see Deactivating Endpoints. Select the checkbox to allow the admin to move one or more endpoints from one group to another. For more information, see Organizing Endpoints Into Groups. Create & Edit Select the checkbox to allow the admin to define, delete, rename, copy, and export policies. Select the checkbox to allow the admin to associate a policy with an endpoint or group of endpoints. For more information, see Implementing policies. Select the checkbox to allow the admin to override how a file is detected by entering the MD5 value of a file. MD5 (Message-Digest algorithm 5) is a cryptographic hash function that acts like a fingerprint to uniquely identify a file. None To not allow the admin to send commands to endpoints, select this radio button. Simple To give the admin access to the Agent and Clear Data commands, and view commands for selected endpoints, select this radio button. Advanced To give the admin access to Agent, Clear Data, Keycode, Power & User Access, Antimalware Tools, Files & Processes commands, and view commands for selected endpoints, select this radio button. Expert To give the admin access all commands, including Expert Advanced options, select this radio button. 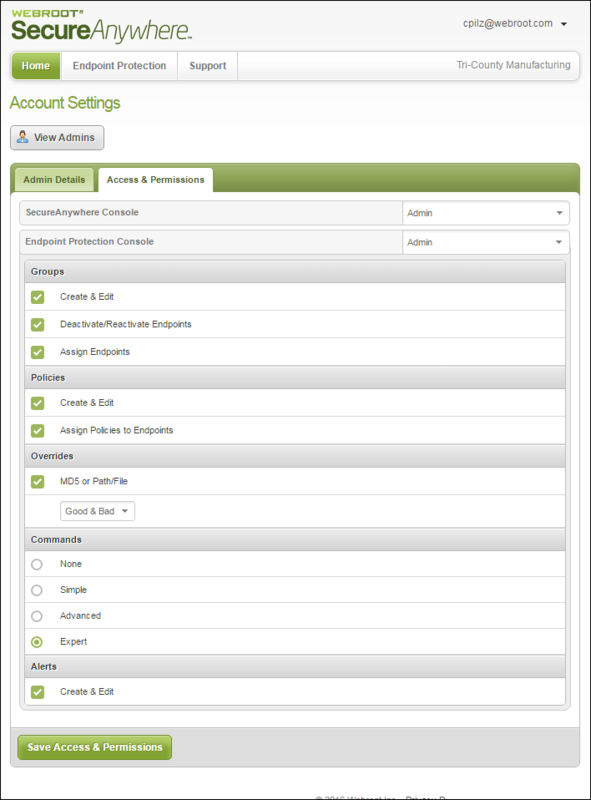 Create & Edit To allow the admin to configure instant or scheduled alerts for endpoint activity, select the checkbox. For more information, see Implementing Alerts. When you're done, click the Save Access & Permissions button.